Yesterday, shortly after the Putin-Orbán press conference ended, I summarized the events of the day and gave a brief account of what the two politicians had to say about their meeting. My immediate impression was that the winner of this encounter was Vladimir Putin. He received an invitation to a member state of the European Union where he has been a pariah ever since June 2014 and was treated well. After forming his government in 2010, Viktor Orbán made no secret of his desire to have not only good economic relations with Russia but also close political ties. No country in the western alliance ever objected to trade relations with Russia, but Orbán’s political friendship with Russia has been watched with growing suspicion, especially after the events in Ukraine. During the last year or so Viktor Orbán has been busy trying to appease the European Union while hoping to get added benefits from Russia. To his domestic critics Orbán’s performance yesterday was embarrassingly subservient. Attila Ara-Kovács, the foreign policy adviser to the Demokratikus Koalíció, described Putin as “a landlord” who came to look around his estate while Orbán the bailiff stood by, awaiting the master’s orders. Putin’s visit to the cemetery has been drawing very strong criticism. Hungary seems to be in such a subordinate position to Russia that the government is unable to make the Russians change the objectionable word “counterrevolution.” What happened yesterday was the humiliation of the nation, critics say. Barring the Hungarian media from the cemetery was also troubling. Did the Russians insist on this? And if so, how could the Hungarian prime minister agree to such an arrangement? The most substantive criticism of Orbán’s performance yesterday was his complete silence on Russian aggression against Ukraine. Two days after he visited Kiev he stood motionless next to Putin, who was “just rewriting the Minsk Agreement,” as István Szent-Iványi, former ambassador to Slovenia, aptly put it on ATV this morning. Orbán’s message to the world was clear: “Hungary needs Russia.” That’s all he cares about. Throughout the press conference he steadfastly supported the Russian position. Today’s editorial in Népszabadság on the Orbán-Putin encounter was titled “Shame.” What did the editorial board of the paper find shameful? The list is quite long. The “strong man of Europe” and “the living statue of bravery” listened while Putin accused the Ukrainians of starting the war and while he called the separatists “aided by Russian regulars armed to the teeth” simple miners and tractor drivers. Orbán didn’t move a muscle when Putin called on the Ukrainian soldiers encircled by Russian and separatist forces in Debaltseve to surrender. He didn’t mention the inviolability of territorial integrity and the sovereignty of a neighboring country. He said nothing about the concerns of the European Union or about the victims of the fighting. In brief, he behaved shamefully. Orbán chose Russia. The die is cast, says Népszabadság. What did Viktor Orbán get in exchange? Not much. Gas, which he would have gotten without all this humiliation from Russia, and scorn from the West. Since yesterday we learned that Hungary is paying $260 for 1,000m³, which is apparently higher than the open market price. At least he avoided signing a long-term contract which, given recent price volatility, would have been a particularly bad deal. Unfortunately, we know almost nothing about what the two men discussed for two solid hours. It couldn’t have been the continued supply of Russian gas to Hungary because that was a done deal before yesterday’s meeting. Viktor Orbán himself admitted today when he talked to a group of journalists that what the deal needed was only the final nod from “the Indian chief.” It also looks as if negotiations about a new pipeline from Turkey to Hungary through Macedonia and Serbia are already underway. 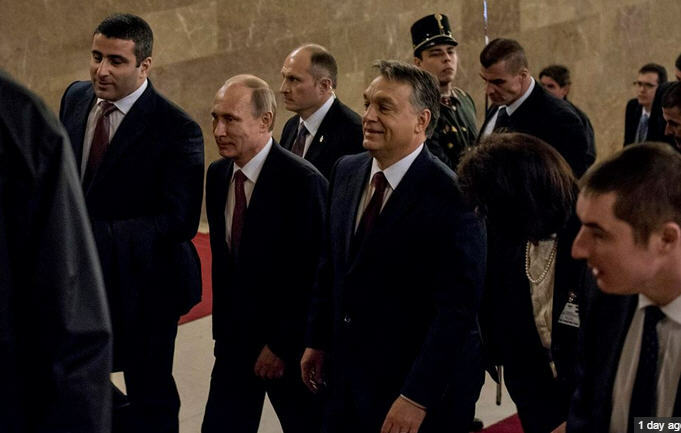 Orbán and Putin were completely alone without any of their aides. What did these two men talk about for that long? Fellow politicians are suspicious. Especially since the Hungarian prime minister cannot be relied upon for an accurate account. Here is a case in point. Grzegorz Schetyna, the Polish foreign minister, gave an interview to a Polish radio station yesterday from which we learned that the week before Orbán went on and on about the absolute necessity of meeting Putin in person because of the extremely unfavorable terms of the present gas agreement. Well, today we know that not a word of Orbán’s lament to Schetyna was true. The meeting had nothing to do with a new gas contract. I for one wouldn’t take Orbán’s words about his difficult relations with Russia seriously. He seemed to be relaxed and happy on the same stage as Vladimir Putin. He looked as if he were basking in the limelight that he shared with the great man. Here was the president of a strong, important nation who didn’t pester him with checks and balances and democratic values. Two weeks earlier he looked decidedly unhappy and annoyed when the chancellor of Germany somewhat undiplomatically announced that as far as she knows there is no such thing as illiberal democracy. Most likely he was humiliated and it showed. After he waved goodbye to Putin in front of the parliament building, Orbán and his close entourage looked extremely satisfied with their performance. It was a good day for Viktor Orbán. It started well and it ended well, as far as Viktor Orbán was concerned. Putin also seemed to be satisfied. Whether it was a good day for Hungary is another matter.